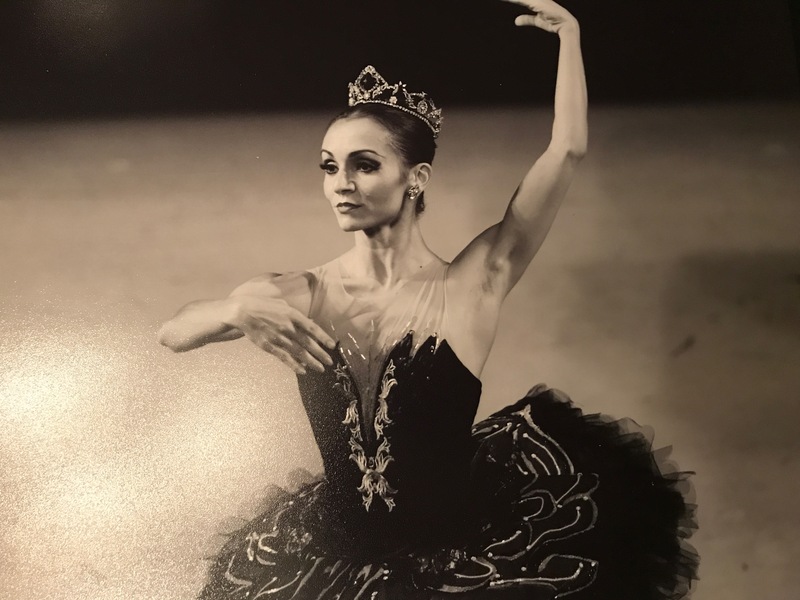 As a professional ballet dancer from Venezuela dancing in Florida, I first saw prima ballerina Mary Carmen Catoya perform the Sugar Plum Fairy in Miami City Ballet‘s The Nutcracker (George Balanchine). It was inspiring to see a fellow Venezuelan dancer who had achieved so much in her career in the US. So I was thrilled to discover that the same year I was to join Arts Ballet Theatre of Florida as a trainee, Catoya was to join as the principal dancer. Since then it has been a true joy and inspiration to have Catoya in the studio. You not only see a brilliant and versatile dancer, but also a humble and beautiful human being. I am honored to have her in my life, to be able to learn from her, to be inspired, to receive her corrections and guidance and to be able to share my thoughts and concerns with her. I am truly lucky to be able to not only call her a role model, but also my friend. She has helped me, even without knowing, in many difficult moments of doubt and frustration as a dancer. Her spirit always fills both the studio and my soul. Claudia Suárez: How did you start dancing? Mary Carmen Catoya: I started accompanying my cousin to dance classes and my teacher told my mom that I was a good candidate for ballet and had talent. This is how I started a 6 year journey with my teachers Everest Mayora, Carlos Nieves and Rafael Portillo. They taught me the basics, the technique and the artistry I still have today, and also deeply educating me in ballet history and the role ballet has in the arts. Catoya dancing “Alicia Alonso” by Vladimir Issaev in La Habana, Cuba, 2017. Photo by Carlos Quezada. CS: You started dancing professionally with Ballet Nacional de Caracas at 13 years old. How were both the process and your experience? MC: There were two major companies at the moment in Venezuela: Ballet Nacional de Caracas (Ballet Teresa Carreño), with younger dancers that were “the new generation”; and Ballet Nuevo Mundo de Caracas, where the dancers were more mature and had more experience. My teacher Everest Mayora took us (her daughter and me) every summer vacation to take classes with Ballet Nuevo Mundo de Caracas, starting when I was 10 years old. With these classes and observing the company dancers, we were nurtured in quality of movement, technique, partnering work, and how dancers develop themselves on stage with their extended repertoire in classical and neoclassical styles. When I was 13, my teacher took us again to company classes, but this time with Ballet Nacional de Caracas. She talked with the Artistic Director at the time, Elías Pérez Borjas, to let us in. After some time, they invited us to dance in their production of Romeo and Juliet as aspirants. This was a very special moment for me (I still have pictures! ), and it also proved to me how a dancer could really escalate that ladder of starting as an aspirant, going on to corp de ballet, to soloist, to principal. In a year or so, I was dancing corp de ballet and soloist parts with the Ballet Nacional de Caracas. Catoya rehearsing at the Mikhailovsky Theatre. St. Petersburg, Russia. Photo by Gene Schiavone. CS: You mentioned your education in ballet history and the arts (I am a fan of this subject), how was this education applied? MC: My teacher used to tell us that a dancer that is not educated, is an illiterate dancer. This is why we were taught about the role of ballet in the arts. You cannot learn just the technique, you had to know the “why”, when the ballet was created, when the music was composed, and even who were the original dancers the choreographies were created on. There were beautiful TV programs (like Clásicos Dominicales) that showed dancers from Rolan Petit to the Bolshoi Ballet, from Balanchine’s New York City Ballet to Baryshnikov, Makarova, Nureyev and Bujones. We always had little quizzes after watching these programs and reading books, and this is how we were evaluated. CS: And do you think that, for the young generations of today, this habit of learning history is gone or not applied? What I can say about the young dancers of today is that, with the internet, they have much more access to information than we had and thus, they should be even more informed. We just had few ballet books… I still keep my book El Ballet: Enciclopedia del Arte Coreográfico (Ballet: The Choreographic Art’s Encyclopedia) I bought in Spain on a summer vacation. I do not want to globalize, but I think there has to be more emphasis on the subject, especially on the classical ballets that have a long history. You cannot go on stage without knowing what you are interpreting, otherwise, you will not project a real feeling to the audience: What is the name of your character? What is his or her story? What is the plot? In what style was the ballet created, Cecchetti, Bournonville, Balanchine’s style, or is it a Russian classic? Catoya as Kitri in Miami City Ballet‘s Don Quixote. CS: How do you prepare for your roles, particularly debuts? MC: It is very curious. You are always preparing because you are in a constant learning process. Even if I had performed a piece before, I still search, wonder, and investigate. There is more access to information to which we can learn from. We have to give the most out of ourselves to a character, but always up to a certain level, never reaching a peak. The beauty of ballet is that we can improve a character, make something different from it, give it a new special flavor and enrich it. Whenever that enrichment stops, the career dies and the spirit of the dancer goes away. The most important thing is to pass a barrier with the public and to reach that, you have to give yourself completely, live on stage, pass your passion, concentration, as well as the communication we have with a partner. The audience has to be wrapped in your magic. CS: How did you leave Venezuela, ending up dancing with Miami City Ballet for 16 years? MC: The first time I left Venezuela was to dance with Cleveland Ballet, and that was an enriching experience where I grew a lot. However, Eduard Villella (former Miami City Ballet’s Artistic Director and founder) asked me to come to an audition after watching my video and my resume. I arrived at the Jackie Gleason Theater (Now The Fillmore in Miami Beach) and auditioned on a performance weekend for Miami City Ballet. I saw Venezuelan dancers (and future colleagues), like Iliana López, Franklyn Gamero, Marifé Giménez, and David Fonegra, which was very special. They were my major reference and role models in the company. Villella asked me to join the company as a Principal Dancer and to watch that night’s performance to have a sense of how the company performs. Villella was a very important person in my career, he gave so much of himself to guide, teach, coach and even partner me during rehearsals. I used to watch his works in Clásicos Dominicales and dreamed about performing his pieces. In all those sixteen years, I danced a wide repertoire going from the classics, to Balanchine works, to Jerome Robbins, Paul Taylor, Twyla Tharp, Alexei Ratmansky, and Christopher Wheeldon. Catoya and Villella during a rehearsal in Miami City Ballet. CS: You just mentioned Villella and MCB former principal dancers as your major inspiration in the company. Who were your idols when you were younger and who inspires you now? MC: In my childhood, of course, I thank all my teachers and ballet masters for all the discipline, constancy, work and devotion that they taught me. I also have to thank my mother, who was always there for me and made all kind of sacrifices. There was no internet, so if we talk about dance idols, I was looking at all the people I watched on TV and read in books: Mikhail Baryshnikov, Rudolf Nureyev, Natalia Makarova, Cynthia Gregory, Cynthia Harvey, Fernando Bujones, Maya Plizetskaya, Carla Fracci… Names that were the top of the top in ballet. I liked how Maya unwrapped herself on stage, with a bravura no one else ever had. I had the honor to dance Giselle with Carla Fracci’s costume in the second act with Miami City Ballet. When I started growing up, the list of dancers started to change: Sylvie Guillem (whom I had the honor to dance with at a Gala in Spain), Tamara Rojo, Darcey Bussell… You have to see the beauty in each dancer, how unique they are and how they give everything on stage differently. Despite all this, I think my best reference were my teachers, who were the examples I saw every day and who took care of me every second of my young career. CS: How have you stayed motivated and inspired throughout your career? MC: There are always certain circumstances within the career and life that we are not happy about. We all have our ups and downs. The person that was always there for me during these difficult times, and will always be, is my mother. She is the person who helped to develop me not only as an artist but as a person. In those moments of weaknesses (there have been uncountable times), where people told me “you can’t” or “you are not for this”, she has been by my side giving me strength. Thanks to her, I am where I am today. Over these last years, my husband has joined her, and now, my son. Thanks to them, I came out of my last difficult times. No matter what people say or tell you, you have to look at their positive side, learn from them, and evaluate from who that bad comment comes from. We have to carry on, because there is nothing more beautiful than falling and getting back up. Catoya dancing with her husband, Wilman Gamero. El Encuentro by Vladimir Issaev. CS: Now that you mentioned your son, and for all those who are mothers (or will be), how was that process of dancing after giving birth? MC: It is interesting because I danced on stage up until I was four months pregnant with Alexander. People thought I was crazy… I danced Tchaikovsky Pas de Deux and a very demanding Ratmansky piece while pregnant. Of course, I kept taking classes until days before giving birth, even in pointe shoes. However, dancing with my baby inside me was a unique experience. He gave me more strength, and it was noticeable. After giving birth, Alexander had a lot of people that took care of him, from the costume crew at Miami City Ballet to my husband Wilman, who was and is always here for me and my family primarily. Now, as far as my post-birth experience, the only thing I can say is that “if you don’t fight, you will never get what you want”. I worked really hard to come back. After all, why put obstacles in our lives, when there is a little person that is waiting for you and who will see you as his or her major inspiration? I want to be the best example for my son. CS: Do you have any top favorite ballet? MC: I was raised around Vicente Nebrada’s style, and one of the ballets that very few dancers could do, at least at my times, was Lento, A Tempo e Apassionato. It is not a ballet where you do interminable fouettés, but it has a certain technique and an artistic prodigality. It is composed by three strong connected pas de deux, one after the another without rest. The ballet shows not only straight lines but also lines in movement. This is one of the ballets I always dreamed to dance. I had the honor to go back to Venezuela and perform it in a gala honoring Nebrada, with the orchestra being directed by Gustavo Dudamel. Other ballets I can include here are Balanchine’s Theme and Variations, Wheeldon’s Liturgy, and classics like Don Quixote (I feel I have Kitri in my veins, I am a daughter of Spaniards), Romeo and Juliet, and Giselle. CS: What are your future plans? MC: Right now, I will meet again with one of the ballets I danced at the beginning of my professional career, now with Arts Ballet Theatre of Florida: Nuestros Valses (Our Waltzes), by Vicente Nebrada. This is something I have been craving for a long time. Also, our director Vladimir Issaev is in the preparations of creating a new ballet that will be called Vértigo, based on Alfred Hitchcock’s movie and the libretto courtesy of Mr Baltasar Martín. I am sure this will be a ballet that young people will be interested in since the plot is very controversial. I have more plans in mind, but I do not want to jinx them! Catoya in “Rojo” (Red). Vicente Nebrada’s Nuestros Valses with Arts Ballet Theatre of Florida, October 2017. Photo by Patricia Laine. CS: Do you have some anecdotes you want to share? MC: One of the most controversial things that happened in my career, was the fouetté penché. Maestro Vladimir taught me this step upon arriving in Venezuela from Russia. The first time I performed it on stage was in Nebrada’s exciting ballet Doble Corchea. Then, I danced it one of Issaev’s pieces, Shostakovich Suites. In Miami City Ballet, I did it in Ashton’s Le Patineurs. People were going mad about it! They never understood how I did it, but it has a certain technique. One recent and beautiful anecdote was to have danced Eros’ Game, by Maestro Alberto Méndez, both in the company and in La Habana, Cuba. This piece does not only require a strong technique and contemporary dance, but also acrobatic movement. Many galas can be included here too, like dancing for the Spanish King and Queen and the Gala of the Stars in Los Angeles alongside Roberto Bolle and Hermán Cornejo. Catoya with Hermán Cornejo and Roberto Bolle in Los Angeles, 2015. CS: Lastly, any advice for all those young dancers out there? MC: Never give up! Fight until the end, with discipline, constancy, passion and love. Everything that you achieve is in your hands and heart; and if you do it with your heart and put in all your effort, you will reach whatever you want. All of us put obstacles in our life, and yes, they will be there. But never say “I can’t”, rather, change it for “I can, and I am going for more.” Love what you do, and never stop growing! Catoya just finished dancing in Arts Ballet Theatre of Florida‘s Latin Bravura. You can watch her in The Nutcracker, which is Issaev’s next program of performances. You can also follow Arts Ballet Theatre of Florida on Facebook, Twitter @ArtsBallet, and Instagram @artsballet, to see the latest news and updates about their upcoming performances as well as weekly videos and photos.